Most central banks communicate more openly with the markets than they did 20 years ago. The column argues that more speeches, more forward guidance, and more transparency has often worsened the accuracy of private-sector forecasts. Too much communication may be the problem, creating a cacophony of policy voices. Central banks have markedly increased their transparency and frequency of communication over the last 20 years, in an attempt to align expectations with monetary policy decisions. Blinder (2007) argued that the major purpose of communicating with the markets is to condition expectations about future monetary policy. The power to use public statements to shape market expectations of future policy is potentially one of a central bank’s most powerful tools. In recent work (Lustenberger & Rossi 2017a), we investigate the frequency and transparency of central bank communication in 73 countries between 1998 and 2014. We want to find out if how these tools have affected the accuracy and dispersion of private-sector forecasts of short-term interest rates, long-term yields, inflation, and GDP growth. First, we construct a comprehensive and explicit measure of communication consisting of central bank speeches collected by the Bank for International Settlements (BIS). 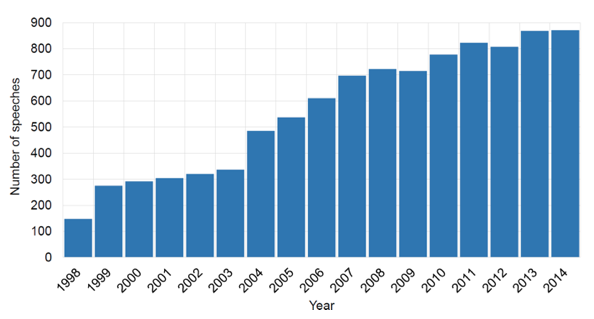 Figure 1 shows the number of speeches per year. There is a steady increase, from about 150 speeches in 1998 to nearly 900 in 2014. This is partly because more central banks now report to the BIS, but the main increase was due to more speechmaking by the major central banks. Our measure of central bank communication has the advantage that speeches are announced months in advance. Some speeches may have resulted from unexpected events that the central bank considered important enough to justify verbal intervention, but this is unlikely for most of them. So, while the number of speeches is fixed in advance, their content takes the economic situation into account. This makes our communication proxy a well-defined exogenous variable. We interpret a speech as a signal sent by the central bank in a Bayesian expectations framework. This means we predict that more signals would increase the accuracy of forecasts and decrease their dispersion. In an uncertain environment, particularly, effective communication is expected to reduce both the inaccuracy and dispersion of forecasts. But our main result is that intensified communication has actually worsened the accuracy and precision of financial and macroeconomic forecasts. Judged by our yardstick, central bank communications did not condition expectations about future monetary policy. The evidence is more in line with Simon (1971), for whom “a wealth of information creates a poverty of attention”. One policy conclusion from our analysis: central banks ought to speak less often if they want to improve the quality and alignment of forecasts of variables that are central to monetary policymaking. The most prominent change in central bank communication has been a widespread use of forward guidance. This means that a central bank communicates about the current setting of monetary policy, but also makes explicit statements about the future path of policy. In the same research, we find that forward guidance as pursued after the financial crisis has not been effective. It did not affect either the errors or the dispersion of long-term yield forecasts and had only a weak effect on short-term interest rate dispersion. In a companion paper (Lustenberger & Rossi 2017b), we demonstrate ways in which the precision of public and private information in an economy can be measured. We find empirical evidence suggesting that, under forward guidance, public information has been less precise than private information. This contradicts the intention of forward guidance. Our first paper also investigates the impact of central bank transparency on financial and macroeconomic forecasts. We use the composite transparency index of Dincer and Eichengreen (2014), its five sub-indices, and its 15 components. Scores range from zero (lowest transparency) to a maximum of 15 (highest transparency). Figure 2 shows the transparency situation at a selection of central banks as of 2014. A large variation among countries is apparent, from the most transparent (the Swedish Riksbank) to the two least transparent ones (the Saudi Arabian Monetary Authority and the Bank of Guatemala). 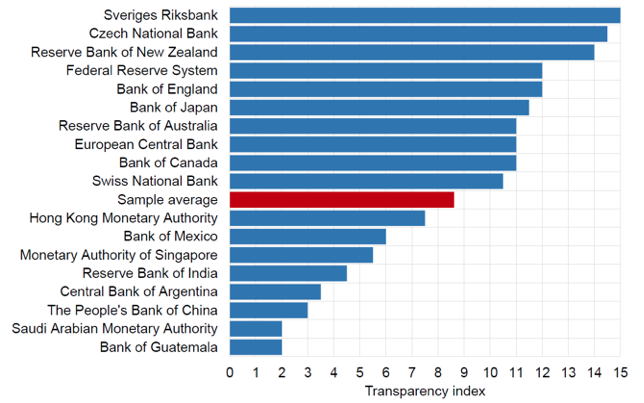 The major central banks had a transparency level well above the average of the 73 countries in our sample (marked in red). Our regressions suggest that we should not expect too much from greater transparency. We find compelling evidence that bank transparency, as with communication, has not been an effective instrument to improve the accuracy of private-sector forecasts. Detailed results show that central bank transparency is not a one-size-fits-all model. It has effects that vary significantly across countries and variables. Some aspects, such as the publication of voting records, are even detrimental to the quality of interest rate forecasts. We also investigate the importance of central bank independence for the quality of private-sector forecasts (Lustenberger and Rossi 2017a). We find that a higher turnover of governors (in other words, they each spend less time in office) reduced the precision of interest rate and inflation forecasts. This is intuitively comprehensible. But we also find a surprising result – greater central bank independence worsened the quality of forecasts. Our preliminary results suggest that independence increased the size of monetary policy committees, which, in turn, gave rise to a cacophony problem. There were too many, possibly conflicting, voices. Our results are in line with the Blinder (2004), for whom uncoordinated communication by committee members might actually lower, rather than raise, the signal-to-noise ratio. This would hamper the operation of monetary policy. In other words, a “central bank that speaks with a cacophony of voices may, in effect, have no voice at all” (Blinder 2004: 57). It is not always optimal to reduce disagreement among forecasters, so is this imprecise communication an unintended effect or a deliberate choice? There might be circumstances when forecasters underestimate uncertainty, and the central bank finds it appropriate to encourage disagreement. For example, in uncertain times, the central bank may want to convey the increased uncertainty underlying its own forecasts truthfully to the markets. At other times, it may aim to discourage risk-taking behaviour. In general, however, the evidence is that the cacophony in monetary policy committees is, as Blinder (2007) has argued, a problem. Blinder (2007) sums up the policy effectiveness argument for central bank transparency as teaching the markets to “think like the central bank”. Doing so would enable the central bank to manage expectations of future monetary policy better and, in particular, to keep them in line with its own thinking. Our results suggest that we should not expect too much from higher central bank transparency, particularly if they are already fairly transparent. In addition, communication can devolve into cacophony, creating confusion among the target audience. This may be a result of too much talk, from too lengthy and complex communications, from uncoordinated monetary policy committees, from too many voices on monetary policy issues, or discussion of too many topics not directly related to monetary policy decisions. This will be an important avenue for future research. Authors’ note: The views, opinions, ﬁndings, and conclusions or recommendations expressed in this column are strictly those of the authors. They do not necessarily reﬂect the views of the Swiss National Bank (SNB). The SNB takes no responsibility for any errors or omissions in, or for the correctness of, the information contained in this column. Blinder, A S (2004), The Quiet Revolution in Central Banking Goes Modern, Yale University Press. Blinder, A S (2007), “Monetary Policy by Committee: Why and How?”, European Journal of Political Economy 23(1): 106–23. Blinder, A S (2017), “Through a Crystal Ball Darkly: The Future of Monetary Policy Communication", Princeton University, December. Dincer, N N, and B Eichengreen (2014), “Central Bank Transparency and Independence: Updates and New Measures”, International Journal of Central Banking 10(1): 189–253. Lustenberger, T, and E Rossi (2017a), “Does Central Bank Transparency and Communication Affect Financial and Macroeconomic Forecasts?”, SNB Working Paper 2017–12. Lustenberger, T, and E Rossi (2017b), “The Social Value of Information: A Test of a Beauty and Non-Beauty Contest”, SNB Working Paper 2017–17. Simon, H A (1971), “Designing Organizations for an Information-Rich World”, in M Greenberger (ed. ), Computers, Communications, and the Public Interest, The Johns Hopkins Press: 37–52.